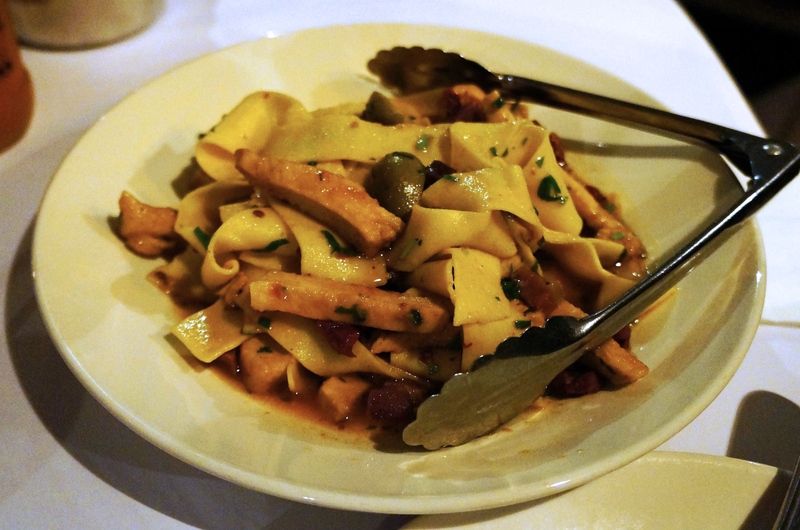 My mother always told me there was a very good Italian restaurant in Haberfield that she has visited ‘x’ number of times, turns out she was talking about Pappardelle. This time I went to celebrate my sister’s 18th birthday along with my mother and Mr C. It was pretty full already when we arrived but luckily my mother made a reservation in advance. The table assigned to us was near the door (it was a windy and cold night), and Mr C asked one of the waitresses if we could move our table inside the restaurant a bit more. There was clearly a lot of space but the waitress gave us a pretty bad attitude and said it was fine how it is. Not wanting to put ourselves in a bad mood, we sat at our assigned table. Despite the downsides, the food was great! 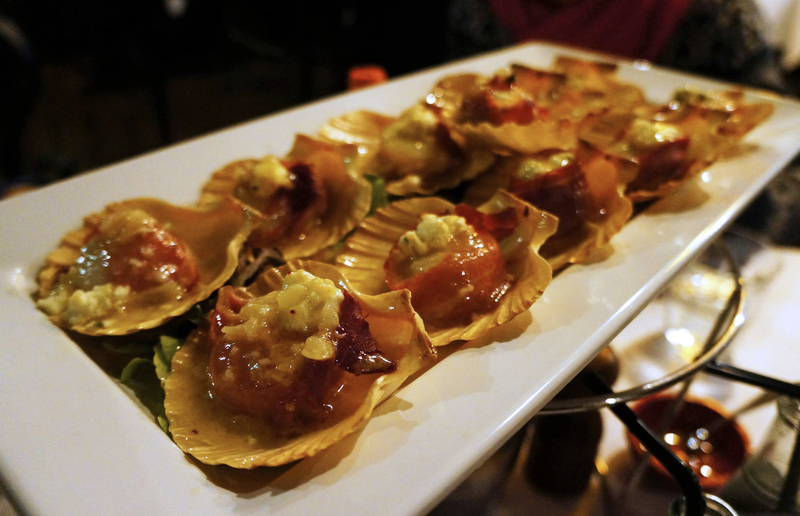 The image above is of our entree, the Scallops wrapped in Prosciutto and Fetta. My mother had been going crazy telling me about this dish to me at home and I’ve always wondered what could be so special about scallops? Well now my question has been answered! I was so surprised how the prosciutto was wrapped around the scallops with my favourite feta. A great combination that satisfies my cravings for some of my favourite ingredients. The scallops were quite large and cooked superbly well, a very different type of scallop dish that I haven’t had and never thought could exist. The feta gives it a more creamier texture and sour-ish taste is amazing. I could hear that we weren’t the only table slurping our scallops down. 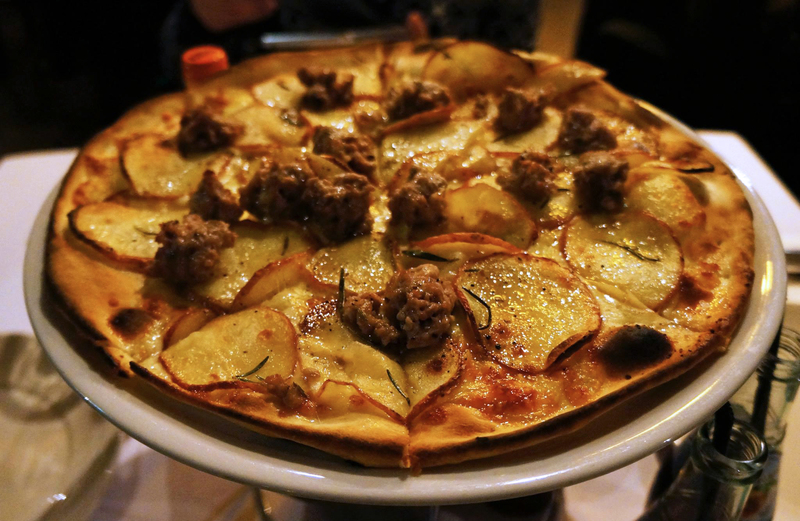 We wanted to try a pizza that we’ve never had before, so voila, a potato and meatball pizza. I found myself enjoying the potatoes more compared to the rest of the ingredients. Think of ‘Thins’ Smith Chips but in a baked chips style. The Meatball was quite tough but maybe because I was expecting it to be like Swedish Meatballs which always turn out tender. Despite that, I did enjoy the pizza, especially the crispy burnt crust. It had me full after 1.5 slice and there was still 2 dishes to come. This is not the ordinary carbonara that you will find in Sydney CBD. It has a very strong taste as the sauce is quite distinctive especially when combined with the chilli sauce that you are also given, it also has a light-weight creamy texture. There wasn’t much of a variety in terms of ingredients with only ham, olives and mushrooms from memory but the fettuccine was tasty regardless and were likely to be me home made. I was quite shocked how the hot chilli sauce was considering it was an Italian restaurant. The second pasta dish which we picked – You could say this was the ‘meatier’ pasta for the night, but again the flavouring was very distinctive. 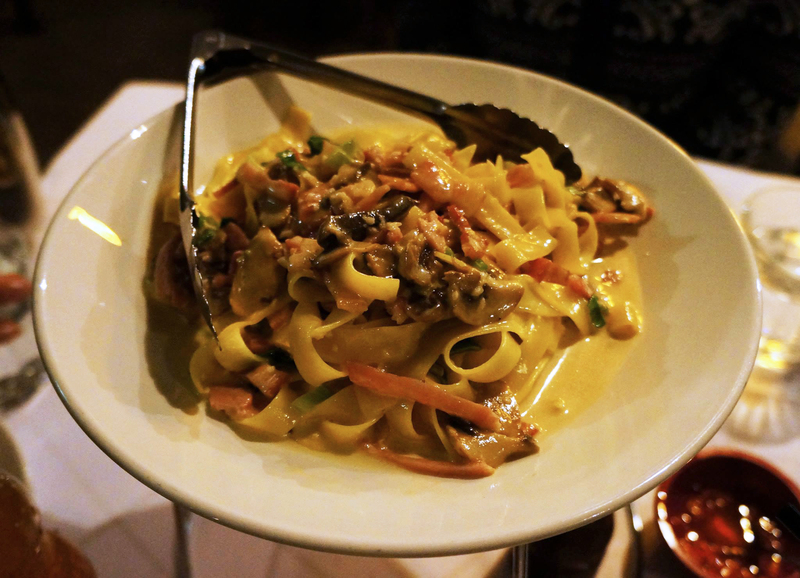 I especially enjoyed the tagliatelle as I haven’t had it before and personally enjoyed it more than the fettuccine because it’s much more filling. It’s not a creamy type pasta, it seems more focused on olives and olive oil as the base so it’s quite hearty. 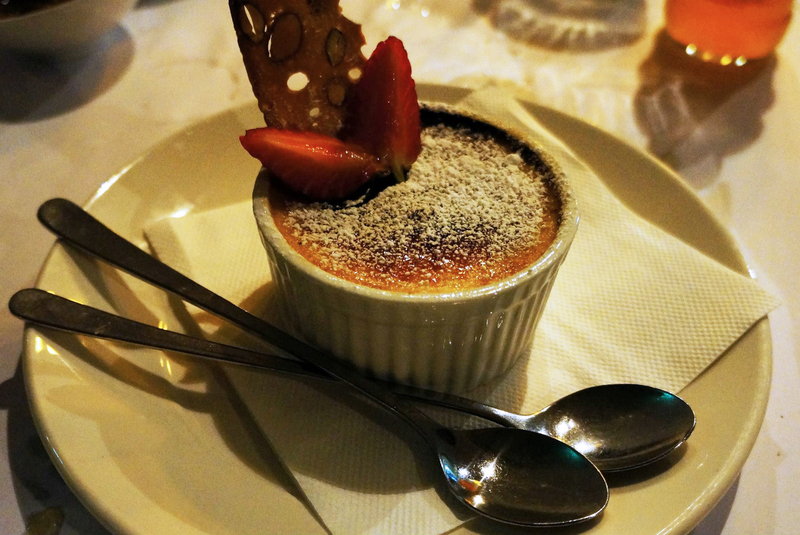 Mr C and I shared the first dessert dish as I have been obsessed with creme brulee and the flavour of the night was Blueberry. I went crazy when I saw the toffee as I’m sure it’s everyone’s favourite part and not just me. It was very sweet and creamy inside just as I expected. 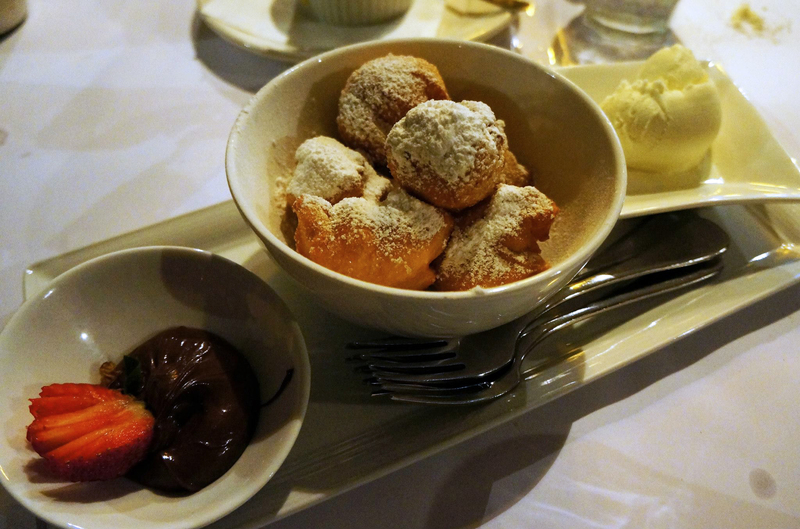 My mother and sister shared the second dessert of nutella doughnut balls. Although I didn’t have the doughnut balls, I had a small spoonful of icecream and I was in love! My only regret was not tasting the rest of the dish as it did seem quite nice. Overall I would say that Pappardelle is a fairly decent Italian restaurant, it does have some downsides with the service but the food makes up for that. Haberfield is definitely one of the hotspots in Sydney for authentic home made Italian cuisine and Pappardelle fits that perfectly. The scallops look delicious. There are quite a few Italian restaurants in Haberfield and I’m always on the look out to for some unique dishes.